In honor of the occasion, I am back with another guest post at KCET’s SoCal Departures Writing on the Wall blog, thanks to an invitation from Ed Fuentes. So click over there to see my Top Ten places you need to see the Millard Sheets Studio artwork in person. With about 200 to choose from, any such list is sure to be controversial! Jean Goodwin (later Ames), “Three Women Gathering at the Sea Shore,” Federal Art Project mosaic for Newport Harbor Union High School, 1937. 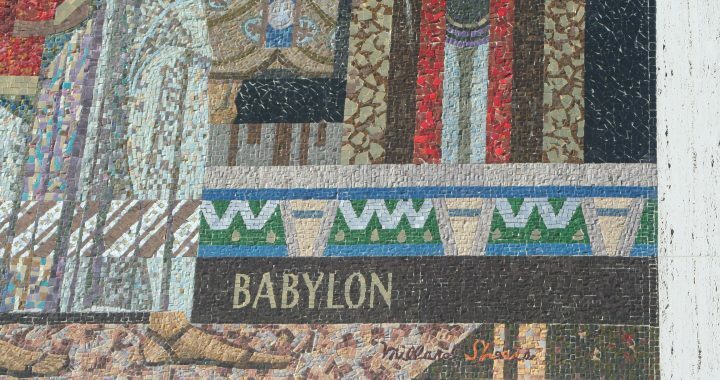 When Millard Sheets first designed mosaics, he sent them off to be fabricated by the Ravenna Mosaic Company of St. Louis, run by the German Heudeck family. It was only after he crossed paths with Jean Goodwin Ames and her husband Arthur Ames that Sheets could imagine fabricating mosaics in California. Jean and Arthur met in a MFA ceramics class with Glen Lukens, at USC, where Jean created her first majolica tile mural in the Science building, Youth and Science, as her MFA thesis (image here). 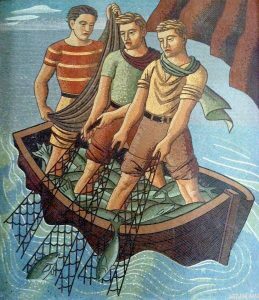 Arthur Ames, “Three Fisherman,” Federal Art Project mosaic for Newport Harbor Union High School, 1937. Bruton Sisters, “St. Francis” mosaic, San Francisco Zoo, 1934. Image via Vicki & Chuck Rogers on Flickr. The Ameses were part of a veritable movement of artists, especially in California, learning the art of mosaic in the 1930s. According to the research of Lillian Sizemore, mosaicist and mosaic researcher, as well as Sharon Musher, a historian of the New Deal arts projects, Maxine Albro and the Bruton Sisters were employed through the Federal Arts Program in the Bay Area (including at the San Francisco Zoo), where, in the words of the Ameses, they acquired mosaic skills from “imported workers” from Italy who had come to work on mosaics at Stanford, among other locales. 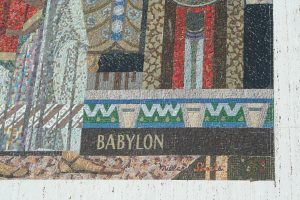 Union High School were likely among the first public mosaics fabricated by Americans in the state of California. The preponderance of square tiles; the heavy, dark lines; and the massive, static feel of the figures do not bear the mark of the later Sheets Studio mosaics, reflecting more the large figures of the contemporaneous Mexican muralists, and Soviet Socialist-Realists. The material is also different. As Jean later said, “at that time it was almost impossible to get the Byzantine [glass] mosaic [tesserae] that is used in Italy, and we used native material,” hard, high-fired matte vitreous (clay) tiles from scrap heaps as well as tile from manufacturers such as Gladding McBean. But the interplay of colors to create depth, and the cut tiles that provide hints of motion—in the women’s hair, in the pelican’s feathers—show the promise of how their technique evolved. Jean and Arthur Ames were married in 1940, and Millard Sheets recruited Jean to the faculty at Scripps College, while Arthur became Professor of Design at Otis Art Institute. Their artwork moved progressively through a number of media—paintings to mosaics to woodcuts to copper enamel to tapestries, and, in most cases, from figurative to abstract compositions. The Ameses did a few mosaic commissions for the Sheets Studio – at Claremont United Church of Christ; at the Mercantile National Bank building in Dallas; at Ahmanson Trust in Beverly Hills; – as well as enamels and a lion for the first Home Savings, at 9245 Wilshire. 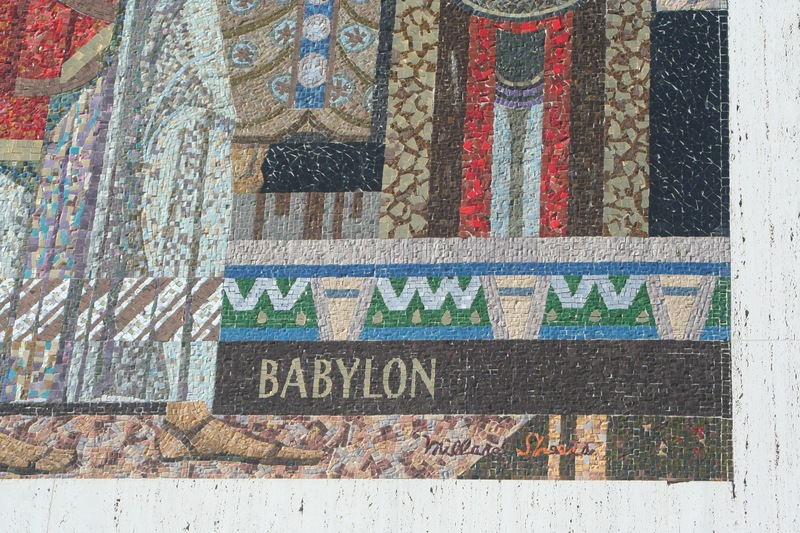 Their interview also mentions a majolica tile mosaic for Guaranty Savings in Fresno, and work for “the Pomona Loa,” under the direction of Millard Sheets — but I am unsure what exactly that was, and its fate. The influence of the Ameses at the Sheets Studio was mostly through the skills endowed to their students who worked in mosaic – Martha Menke Underwood and Nancy Colbath most prominent among them. 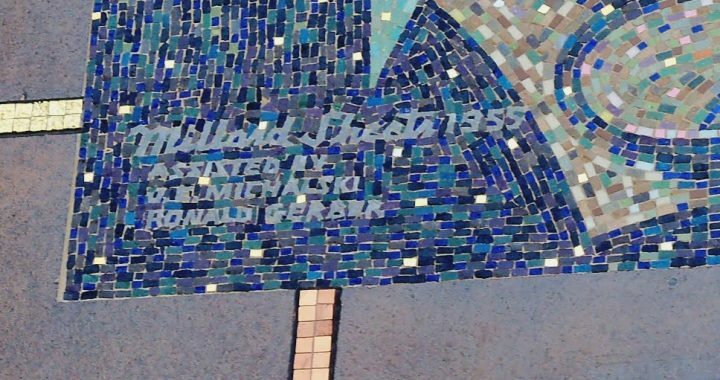 The mosaic at the first Home Savings mosaic, completed 1955, is signed with the names Millard Sheets, J.E. (likely James Edgar) Michalski, and Ronald Gerber—and I am still trying to track down who these last two individuals were. Millard Sheets, J.E. Michalski, and Ronald Gerber, mosaic for Home Savings, 9245 Wilshire, Beverly Hills, 1955. Photo via Vickey Kalambakal. In 1999, Newport Union demolished the building where the mosaics were, outside facing a patio—but, thankfully, their wall was preserved. They now occupy pride of place in a hallway at the entrance to the school, with a plaque describing their history. Next week we will look at what happened after the grand era of Denis O’Connor mosaics for Home Savings — when his smaller operation could not handle the timing demands of Home Savings, expanding across the nation. 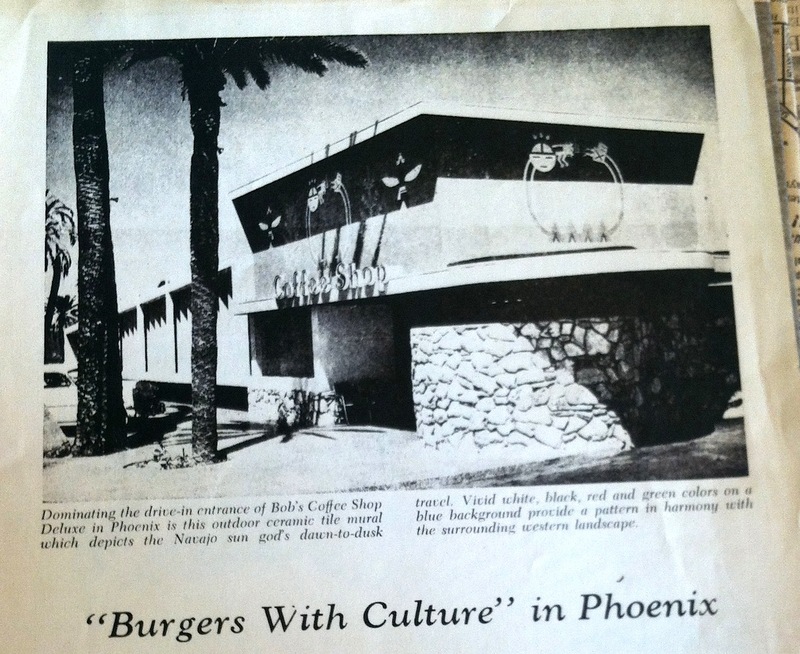 Millard Sheets Studio, Native American themes in mosaic, Bob’s restaurant, Phoenix, 1954. 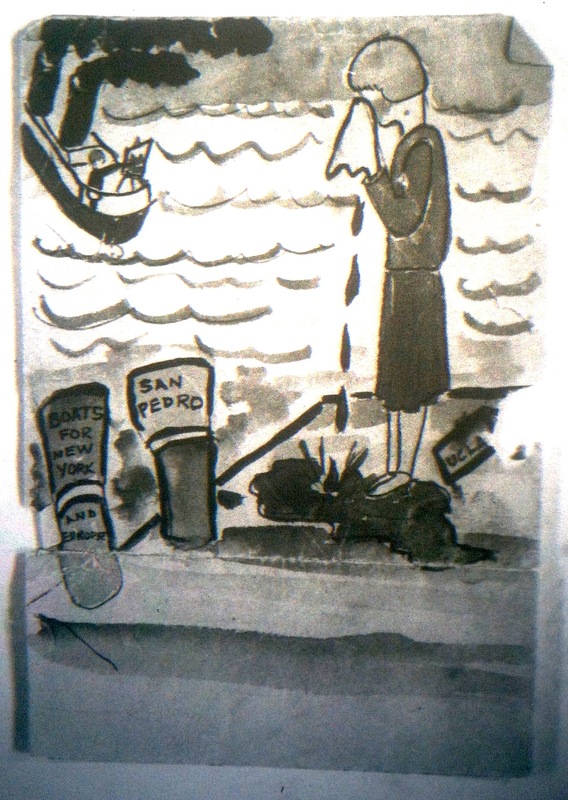 From “Burgers with Culture,” TILE Magazine, 1955. S. David Underwood Archive. As discussed last week, S. David Underwood, the Sheets Studio’s principal architect, got his break working for a Glendale chum, Robert C. Wian, as he expanded Bob’s Big Boy into an iconic franchise. The Bob’s Big Boy in Burbank is a Googie icon, designed by Wayne McAllister, is a historic landmark. 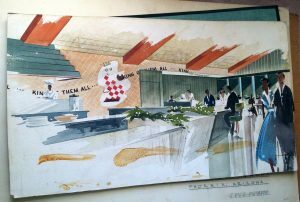 But the Phoenix’s Bob’s restaurant, designed by Underwood — which had mosaic work designed by Millard Sheets — seems to have been destroyed. 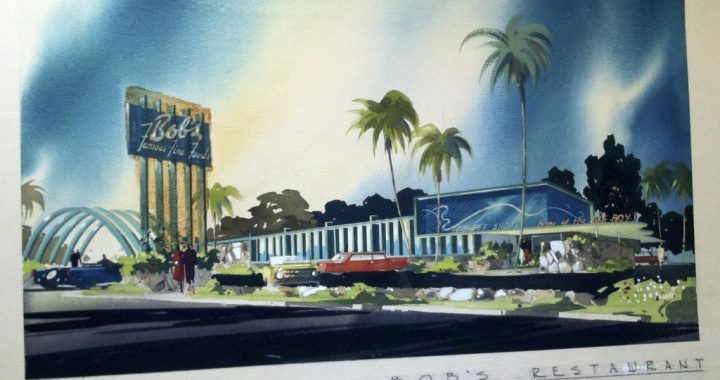 Underwood’s extant drawings show the Phoenix franchise was conceptualized as a near-copy of the Burbank location, but that subsequent designs changed the elements, though still within the Mid-Century Modern/Googie/drive-in styles. 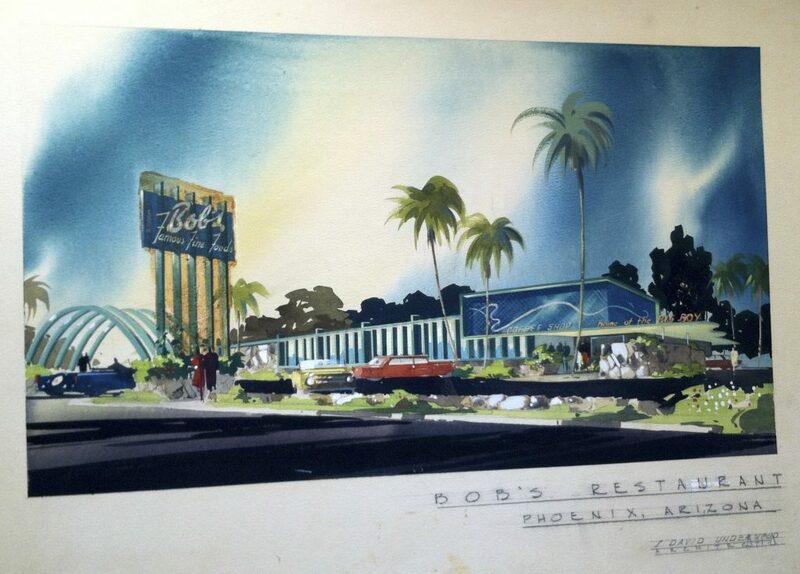 S. David Underwood, Sheets Studio, sketch for Bob’s exterior, Phoenix. c. 1954 S. David Underwood Archive. A large, billboard-like neon sign with the Bob’s name, arches flying over the driveway entrance, and alternating black and white panels mix the feel of Sheets Studio designs–and this was one–and the Bob’s Big Boy checkerboard pattern. Sketches and photographs show how the wall design and counter layout were all carefully planned, with the Sheets Studio sense of interior precision. 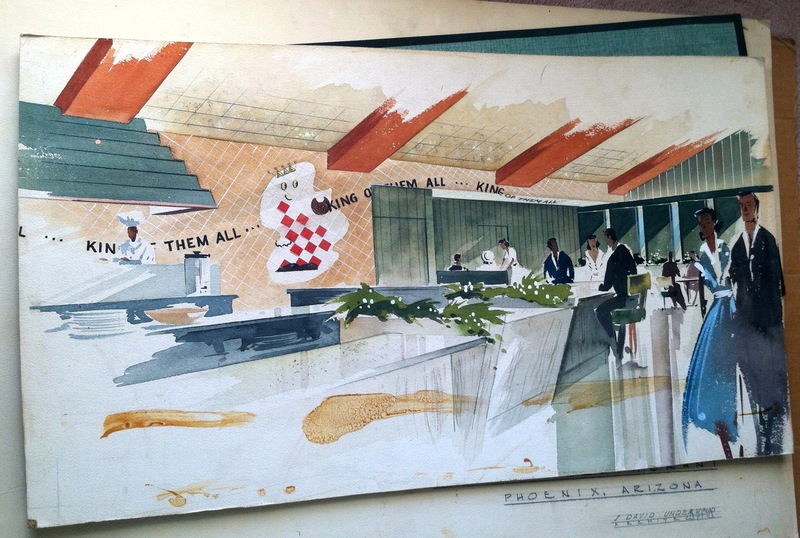 S. David Underwood, Sheets Studio, sketch for Bob’s interior, Phoenix. c. 1954 S. David Underwood Archive. But what might surprise even the Bob’s aficionados is the Millard Sheets-designed mosaic of Navajo, Apache, and Pueblo (or Hopi?) 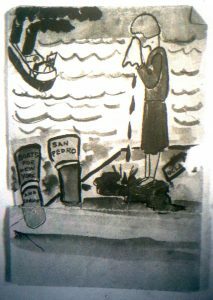 “gods and legends,” known to us through this September 1955 article in TILE magazine. Though we only have a black and white photograph, the TILE magazine caption sounds like classic Sheets Studio work: “Vivid white, black, red and green colors on a blue background provide a pattern in harmony with the surrounding western landscape.” Sheets himself is quoted in the article discussing the tile’s durability, suggesting such outdoor, artistic use was unfamiliar. 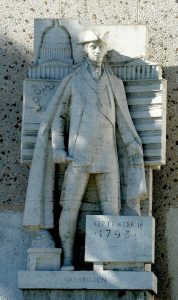 As for the American Indian nations as the source of a theme, Sheets had designed the Thunderbird air fields in the California and Arizona deserts and utilized Native American imagery there as well. Where is this work now? This restaurant was at N. Central Avenue and E. Thomas Road, which Google StreetView suggests two massive office buildings, an empty greenspace, and a strip mall exist today. So chalk this up as another lost Sheets artwork. Millard Sheets, river scene, 1929-1930. Courtesy of Smith Brothers Restaurants. Millard Sheets cared deeply about his artwork, particularly his painting; he cared about his networks, and his ability to connect to people across career, political, or national divides; but he also cared deeply about his family, even when he was far from them. And these strands come together in the story of a painting, seen above, now hanging at the Parkway Grill in Pasadena. Millard had known Mary’s older sister Elizabeth as a fellow student artist at the Chouinard Art Institute, and at a family dinner Millard met Mary. They hit it off immediately, I am told, but their lives seemed headed in opposite directions: Millard was gaining attention in New York and elsewhere for his paintings, and Mary was committed to her studies at UCLA (then called the Southern Campus of the University of California). 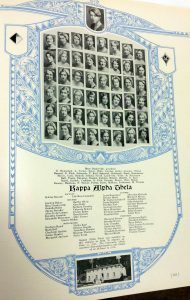 Kappa Alpha Theta Class of 1930, UCLA Archives. 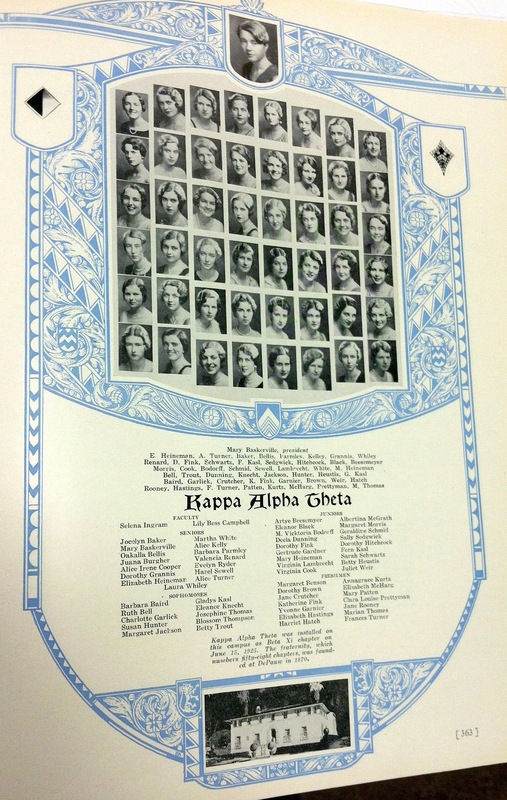 Mary Baskerville, the president of the sorority, is at top; Dorothy Grannis listed among the senior-class members. Mary, an art major in UCLA’s teacher’s college, rose to be president of her sorority, Kappa Alpha Theta–and among its members in her class was Dorothy Grannis, later wife to Howard Ahmanson (suggesting occasions for an earlier connection between the two men than business breakfasts and a famous letter in 1953). Her presidency of the sorority Class of 1930 coincided with UCLA’s move to the newly constructed Westwood campus, and hence the building, funding, and decorating of the large new Greek houses in the neighborhood. Millard wanted to get married, but Mary was also committed to finishing her degree — but in her last semester, in the spring of 1930, these two goals seemed impossibly opposed. Mary decided to leave school and marry Millard before his next trip East, to follow the whims of the art world. But there were also her duties to the sorority – how to placate them? Mary Baskerville, crying self-portrait, 1929; Millard Sheets Papers, Archives of American Art, Smithsonian. 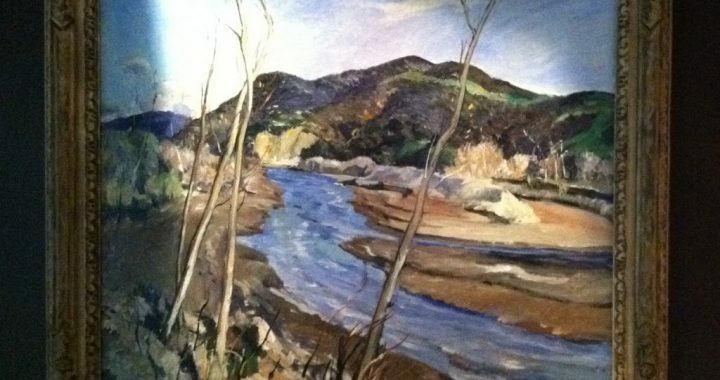 painting, showing a river landscape, given to the sorority in that spring of 1930, as the sorority president left to marry its artist. It hung for decades on the sorority walls, as a testament to the relationships between Millard and Mary, Mary and her sorority. The theme seems appropriate to such a moment of transition as it college — the crossing over of the river, the forking water path, and the question of what lies beyond, up upon those mountains. 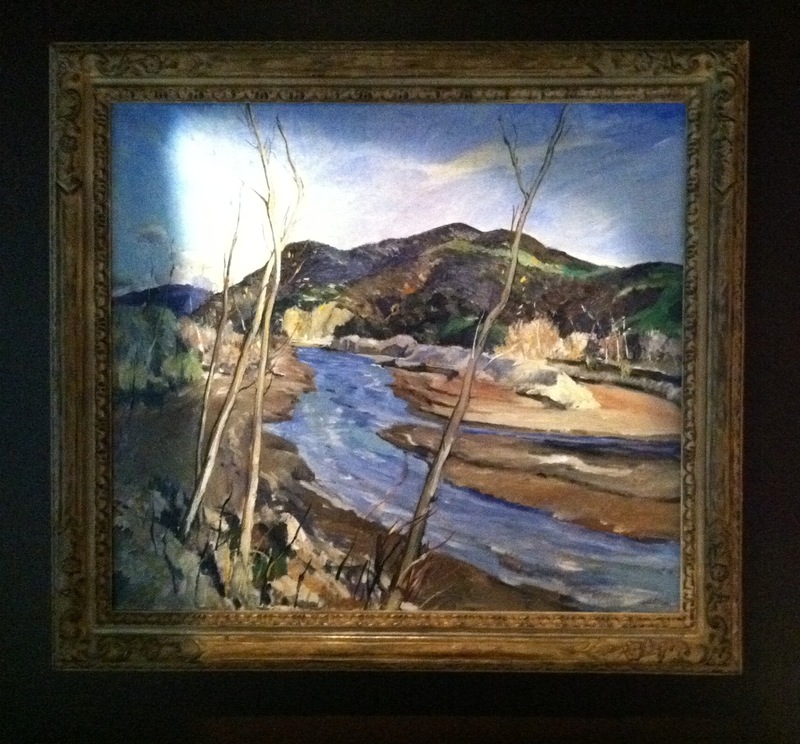 It can now be seen amidst a wonderful collection of Millard’s paintings at the Smith Brothers restaurants in Pasadena. (UPDATE: I am told by Michael J. Johnson that a Giclée-on-canvas replica hangs in the sorority to this day. UPDATE 2: According to Susan Traister, who had the sorority’s paperwork on the transfer, “the Kappa Alpha Theta Sorority at UCLA owns it and loans it out to the Smith Bros.”) Perhaps that is the perfect place to celebrate Mother’s Day this year, and think about the interplay of family, art, and community for Millard Sheets. Thanks to Carolyn Sheets Owen-Towle, Perry Jamieson, Christina Vader, and Bob Smith for providing/confirming elements of this story. 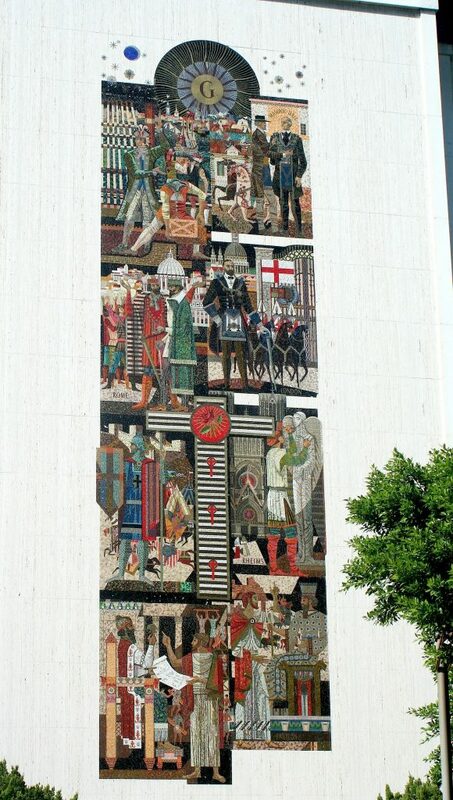 Last week, I was able to drive along Wilshire Boulevard and see my local string of Sheets Studio art: three banks and this monumental building, the four-story former Scottish Rite temple designed and decorated by the Sheets Studio in 1963. 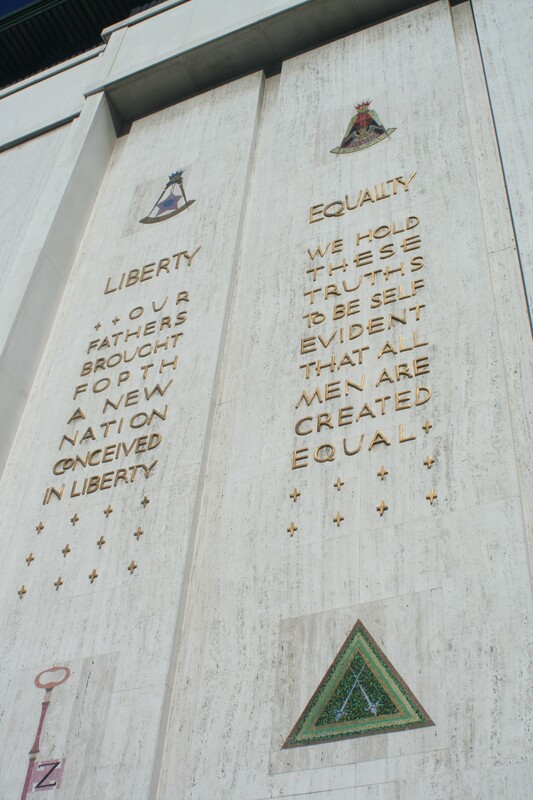 The property is currently for sale; the Los Angeles Masons (Scottish Rite is one of the traditions of the Freemasons, a fraternal organization with many ties to the symbolism of the United States, as Nicholas Cage and Dan Brown remind us) lost a series of court cases over noise complaints and zoning for the building, and as of 2008 the California Supreme Court denied them the right to lease the property for commercial use. The legal fight means that the building has been mostly closed since 1993, and completely closed since 2006, so I have not been able to see the Sheets Studio work inside the building (which I hear is extensive). I provide here only a few examples of the sculpture and quotations from the building; following the tradition of Masonic structures such as the ornate George Washington National Masonic Memorial, built in 1932, that bridge the known history of the Masons (reaching back to the Enlightenment) with the order’s mythology, reaching back to the time of King Solomon’s Temple, with (as this mosaic and group of sculptures gives evidence to) detours into the law-giving and correct-living precepts of Hammurabi’s Code, a number of early Greek and Roman leaders, the builders of medieval cathedrals, Renaissance leaders, and finally American Founders. As anti-Masonic conspiracy theorists are quick to point out, the vast majority of U.S. Presidents have been Masons, along with other kinds of community leaders. But, without any internal knowledge, I have always seen that as a reflection of these individuals’ power, respect, acumen, and ability to network, rather than its cause. From what I gather, the 1950s and 1960s was a high point for recent Masonic activity in the United States — a premier networking and campaigning venue, among an association of the established. And, as the later zoning fight about this building reveals, the prominent location on Wilshire, in what is otherwise a residential neighborhood, flanked with massive Protestant churches, indicates the influence of the Masonic group that built this structure. Two elements of this mosaic interest me, the first being its deeply historical nature. Did this commission push the Sheets Studio toward using more history in the Home Savings banks? Next week I will discuss the first Home Savings location, also on Wilshire, that has a mix of historic and ahistorical imagery. Sheets spoke about how he had almost no guidance from Howard Ahmanson–simply a directive to make the art beautiful. 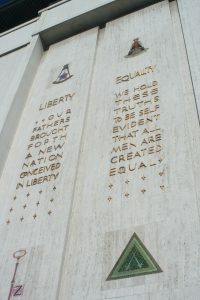 Clearly the Masons had very specific ideas about who should be highlighted, what text should be included, and what gestures, symbols, and clothing would best express Masonic principles. I wonder if Sheets and his collaborators enjoyed the research project, and/or if the reception suggested more historical images would work well. The other element is the mosaic’s style. Thanks to my experience with Alba Cisneros a few weeks ago, cutting tile and comparing Byzantine and Italian tile styles, I can recognize this Scottish Rite mosaic as a transitional moment. In his oral interview in the 1980s, Sheets discussed how the original mosaics were made in Italy, but that, given his disappointments with the results, he began to train himself and his studio in the creation of mosaics. This mosaic was made in California, but the signature technique — Byzantine tile, carefully cut and shaped — is not present throughout; there there are large sections of flat, square Italian-style tesserae, which are machine-made. Perhaps the sheet size of this four-foot mosaic is to blame, but I wonder if Sheets, Denis O’Connor, and others were still perfecting their mosaic tile. More interviews and more time in the archives will tell. Adam Arenson on Home Savings on Wilshire in Santa Monica: Love it or Hate it?